The Gokyo Chola Pass trek via Everest Base Camp is a lifetime adventure. 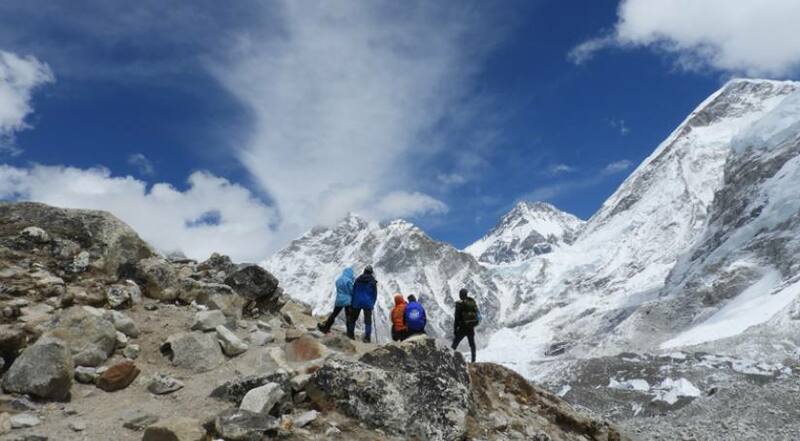 During this trek, you can visit most of the Khumbu region and Gokyo valley. You can witness the Himalayan Sherpa culture, traditions, their hospitality, and Buddhist practices. 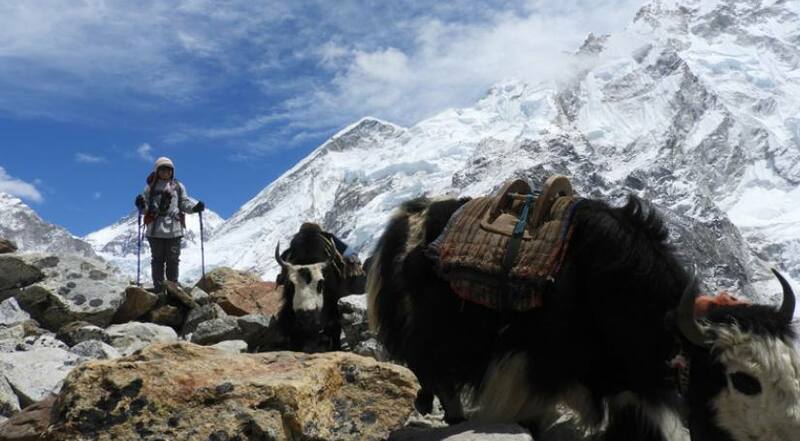 The trek to Everest Base Camp via Chola Pass offers some of the outstanding views of mountains, lakes, and glaciers. Trekking through the heart of Rhododendron forests is an awesome experience. The stunning Gokyo Lakes with their turquoise clear water is overwhelming. This Chola Pass via Everest Base Camp trek is amazingly stunning. The magnificent views of the towering vistas from the Gokyo Ri (the highlight of the trip) will imprint in your heart for a lifetime. And, with our dedicated team of Himalayan Joy Adventure, you will collect memories for a lifetime. Chola Pass Trekking is a moderate grade trekking route in terms of altitude and trails. This trekking is not suitable throughout the year. The best seasons to trek are during spring and autumn. February - May, and October - December is better than other months. At this time, the sky is generally clear. Also, you'll see the best views while experiencing a lovely weather. March to April is Spring, the months of a blossoming of Rhododendrons. Also, you can trek through enchanting forests. You'll see lush forests while trekking in October to December also. During winter, the pass may be closed due to dense snow. Monsoon is not good season either. The wet and slippery trails are riskier. Both the winter and monsoon are not suitable for views and easy trails. One of the highest passes in the Everest region. The thrilling, yet a scenic flight from Lukla airport. Lukla airport is among the 10 most dangerous airports in the world. Several Buddhist monasteries. In places like Namche Bazaar, Tengboche, etc. you will see beautiful monasteries. Himalayan Sherpa culture and lifestyles of hospitable locals. The Chola Pass (5420m), one of the highest pass in the Khumbu region. Stunning Himalayan peaks. You can see adorable peaks like Kusum Kangaro, Lobuche, Makalu, Thamserku, Kangtega, Cho-Oyu, Island Peak, Cholatse, Pumori, Nuptse, Lhotse etc. Mt Everest, the roof of the world, is undoubtedly the major highlight. The Sherpa museum at Namche. Picturesque scenery of beautiful Gokyo Lakes from Gokyo Peak. Khumbu glacier, one of the longest glaciers and The Ngozumpa glacier, the biggest glaciers in Nepal. The colorful Rhododendron forests, while trekking in Spring (March to April). Amazing viewpoints like Kala Patthar and Gokyo Ri. They offer the most beautiful Himalayan panorama along with remarkable sunrise and sunset views. Our team of Himalayan Joy Adventures will receive you at the Tribhuvan International Airport in Kathmandu. We will then transfer you to a Hotel. You can then check into your room and refresh. We will host you a dinner in the evening where we will talk about the trek. Overnight in a Hotel in Kathmandu. On this day, you will visit the renowned UNESCO World Heritage Sites in Kathmandu with our valley guide. You will go to places like Pashupatinath Temple, Boudhanath Stupa, Kathmandu Durbar Square, Swayambhunath temple, etc. An early morning flight from the Tribhuvan International Airport will take you to Lukla. The 45-minutes flight is a wonderful experience of scenic adventure. Your nerves will shake while the plane lands on the steep 60 m mountain runway. From Lukla, you will begin your trek to Phakding on a well-marked trail. Alongside the trail, you will see beautiful landscapes along with a stunning view of Kusum Kanguru. Overnight at a guesthouse in Phakding including breakfast, lunch, and dinner. A filling breakfast in Phakding and you will trek again. Following Dudh Koshi, you ascend through the forests to reach Monjo. Monjo is the entrance gate of Sagarmatha National Park. A steep hike from Monjo takes you to Namche. Namche is a busy Sherpa town in Khumbu region. From Namche, you will get the first view of Everest during clear weathers. You will stay at Namche for two days including the acclimatization day. Overnight at a guesthouse in Namche with breakfast, lunch and dinner included. Namche is a beautiful place to spend a day at. There are many lodges, tea shops, and bakeries. In the acclimatization day, you will adapt to the changing weather and other factors at the Himalaya. You can hike to Syangboche Airport, 3700 m, then to the Everest View Hotel. From the Everest View Hotel, you can get excellent views of Himalayan ranges including Everest, Lhotse, Tawache, etc. Walk down to Namche and visit the Everest Photo Gallery and the Sherpa Culture Museum on the way. Or, you can visit Khumjung village and explore the school set by Edmund Hillary and spend time with local sherpa kids. Overnight at a guesthouse in Namche with all meals included. Walking along the flat and easy trail, you head towards Tengboche the next day. You can enjoy a superb view of Mt. Everest, Nuptse, Lhotse, Ama Dablam including the close-up view of Thamserku. Lunch at Phunki Tenga, the trail is a little tough with steep ascend through the pine forests. The ascend from there towards the right the Dudh Kosi valley takes you to the spiritual Tengboche Monastery (3860m). The Tengboche monastery is the biggest Buddhist monastery in the Khumbu region. It is also a great place to overlook at peaks like Ama-Dablam, Nuptse, and Everest. Overnight stay at a lodge in Tengboche with all meals covered. After having a fine breakfast at Tengboche, you begin descending downhill through a beautiful forest. After crossing over the Imja Khola, you will trek through the Pangboche village. From the village, you will see exceptional views of Ama Dablam. The route continues leaving Pheriche behind. On walking through the green pastures, you will reach Dingboche. From Dingboche, you will see the beautiful Imja Valley and the south face of Mt. Lhotse. Overnight at Dingboche in a guesthouse. Breakfast, lunch, and dinner included. This is your second acclimatization day during the trek. After breakfast, you will walk uphill to Nagarjuna hill (5100m), a hill located just above Dingboche. The walk is physically challenging with the steep paths. From Nagarjuna hill, you will see peaks like Lobuche East (6119m), Lobuche West (6145m), Taboche Peak (6367m), Thamserku (6608m), Kangtega (6685m) and Ama Dablam (6856m). You will also see the Pheriche Valley. Take some rest and start the descent back to Dingboche. Overnight at a guesthouse in Dingboche. Early in the morning, after a filling breakfast at Dingboche, you will trek along the valley to Dughla. Dughla comes after Pheriche (4240 m). You continue up the wide valley watching beautiful Cholatse and Tawache peak. Gaining altitude, you attempt a steep climb towards the base of the great Khumbu glacier. Teahouses at Duglha offer Lunch. After lunch, you will walk through the zigzags to the glacier's terminal moraine. After climbing to the top, you'll see many stone cairns, memorials of Sherpas who died while climbing Everest. Finally, you will climb along the glacier, and descend to the yak pastures. Finally, you get closer to the settlement at Lobuche. Overnight at a guesthouse in Lobuche. Enjoy the meals and get good sleep. 10 Days TREK TO GORAKSHEP 5140M. After a hot breakfast at the lodge in Lobuche, you set-off with a short climb through beautiful meadows. You'll see Khumbu Glacier downwards. Straight ahead is Kala Patthar. On walking for around two hours, you will reach Gorak shep. From there you will continue to the Everest Base Camp. The walk up to EBC is nearly 3 hours. You will walk through many ups and downs. Even though there is no much elevation gain, the walk is tiring. Enjoy the splendid views of the Khumbu Glacier and icefall along with the pleasure of standing on the lap of Mount Everest is blissful. The tiresome journey is worth it. After spending some time there and enjoying the scenic views you will walk down to Gorak Shep. Overnight at Gorak Shep in a guesthouse. Breakfast, lunch, and dinner included. 11 Days TREK TO KALAPATTHER THEN ZONGLHA 4830M. The day starts with an early morning hike up to the vantage point of Kala Pattar. From there, you will see the best view of the South face of Everest and neighboring peaks. The unbelievable Himalayan panorama from Kala Patthar is breathtaking. You can enjoy the scenery! Click your favorites. On spending some time there, you will trek back to Gorak Shep. You'll have time for breakfast there. After a hot breakfast at Gorak Shep, you will descend to Dzongla. Overnight at a guesthouse in Dzongla. All board meals included. 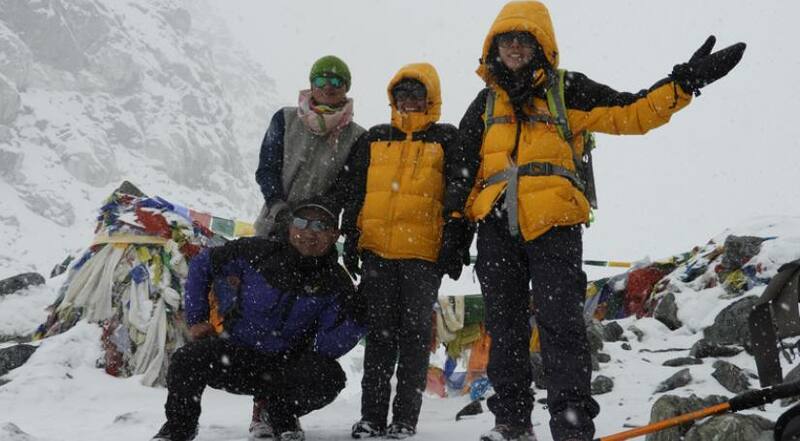 12 Days TREK TO CHO-LA PASS 5420m –DRAKNAG 4700M. This is one of the toughest days of the trek. You start by ascending the trail to Chola crossing. The surrounding view gets more inspiring as you ascend. The captivating appearance of the Chola Lake and the majestic Himalayan range are amazing. However, climbing the inclined steep isn't so easy. The final climb to the Cho La is a bit tricky. You should walk around the deep open cracks. Be careful! Once you reach the top, you can see colorful prayer flags dancing in the cold wind. The majestic view from the pass is awe-inspiring. The path down to Thongnak is long. It is just a descent. Be careful not to step over rocks glazed by ice. You can easily walk down to Thangnak from the Cho La pass. Thangnak is a small village. Overnight at a guesthouse including full board meals. 13 Days TREK GOKYO 4790M. Today is a short trek day! 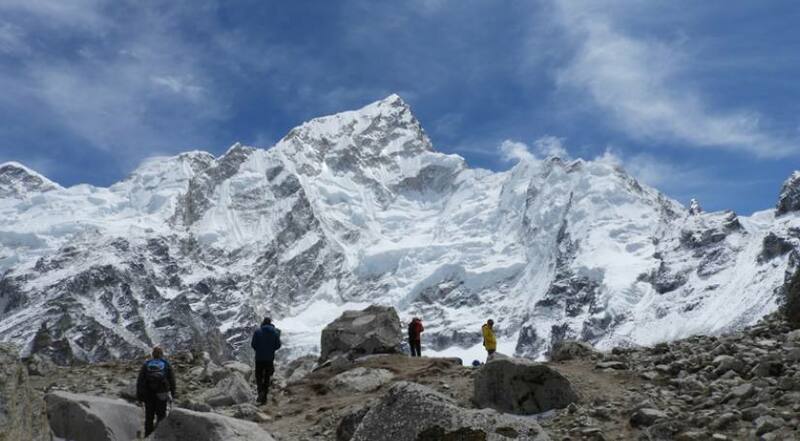 Crossing the largest glacier in the Himalaya, the Ngozumpa Glacier, you will trek to Gokyo. In the valley, you will see perfect views of the second and third Gokyo Lakes. The Gokyo village is a beautiful village at the edge of the third Gokyo Lake. After having lunch there, you can explore around the Lake. Overnight at a guesthouse in the beautiful Gokyo village. Breakfast, lunch, and dinner included. 14 Days TREK TO GOKYO-RI 5360 THEN DOLE 4200M. Early in the morning, you start the hike up to the Gokyo Ri/ Peak. Gokyo peak is the highlight spot of the whole trek. Climb up to the Gokyo peak is steep and strenuous. Once you are there, the scenery of Gokyo village and the beautiful Gokyo Lakes refreshes your tired body. The views of Cholatse and the Ngozumpa Glacier are splendid. The feeling of being surrounded by panoramic mountains is awesome. You will get amazing views of Mt. Everest, Mt. Cho-Oyu, Mt. Gyachung Kang, Mt. Lhotse, Mt. Makalu, and Mt. Nuptse. The visit to Gokyo Ri is truly a blissful moment. The smiles of snow clad peaks, while sun rays kiss them, is immortal. The memories made at Gokyo Ri are indeed lifetime memories. After viewing the majestic views from Gokyo Ri, you trek down to Gokyo. 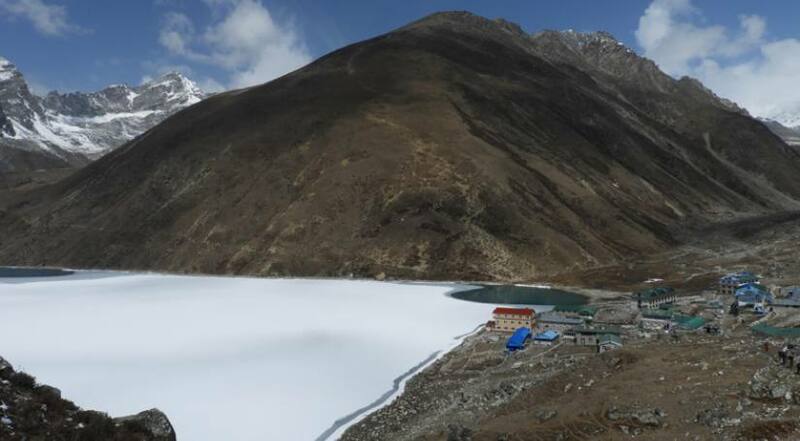 After having a nice breakfast at Gokyo, you start hiking to Dole. Walking across beautiful Rhododendron and Birch forests, you will walk a pleasant hike to Dole. Overnight at a guesthouse in Dole. Following the river, and continuing the hike through beautiful forests you will descend to Phortse Tenga. A complete steep ascends from there takes you to Mong- la Danda. A descend from Mong- la Danda and you are at Kyangjuma. From there, an easy trail gets you to Namche Bazaar, the busy Sherpa hub in Khumbu Region. Overnight at a guesthouse in Namche Bazaar. Today is the last day of the trek. The trek takes you to Lukla by following the Dudh Kosi River. This is the final moment to bid farewell to the towering peaks in the Everest region. You may enjoy your evening with the Sherpas by singing, dancing, and camping. An early morning flight from Lukla takes you to Kathmandu. The flight is short and scenic. You'll surely enjoy it. After you land at the Tribhuvan International Airport, we will transfer you to the hotel. It's time to bid a farewell. You will take off from the Tribhuvan International Airport to your respective places. And, our representative will be there to bid you farewell. Every day the world is facing a big issue of environmental pollution and in Nepal as well. Our field staffs are quite conscious about environmental pollution at any time and we encourage to all. We would suggest to our guest to use boiled water or water purification pills than buying a bottle of water, it helps to avoid plastic bottles which can take a long time to disappear. During the trek, if possible you can order same items food in a group which minimises the fuel used and to make a campfire is almost forbidden. We would encourage being a responsible traveller so, just leaving a footprint on the trail and bring out all non-biodegradable which you had. Himalayan Joy Adventures is committed to helping to improve, protect and preserve the natural and cultural beauty of the Himalayan mountain range and Nepal. Join us. Sometimes the flight may be cancelled due to the unpredictable weather in Luka so Himalayan Joy Adventure has created an itinerary for this trek with one day free/extra day at the end of the trek. In case your flight has been cancelled more than two days, we will charter a helicopter to and from Luka to ensure your flight on scheduled towards homeland or further destination. This extra service cost will be minimum $500 to maximum $4000 USD dollars which you can claim from your insurance.